One of the few accommodations in the National Park! Paridita Island: learn more about this fascinating island - its natural wonders, location, climate & history. Lodging & Cuisine: four palapas that naturally blend with the tropical environment & provide uninterrupted views to the ocean and neighboring islands. Rates & Bookings: cost per night for each season of the year and booking details + special packages for scuba diving, sports fishing & whale watching tours. Guest's Reviews: find out what visitors have to say. 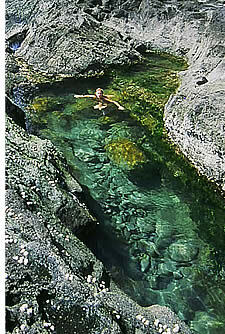 Chiriqui Gulf National Park: learn more about the incredible islands of these protected waters. If you don't have a chance to spend several nights in this part of Panama, check out our Day Trip to the Chiriqui Gulf National Marine Park. 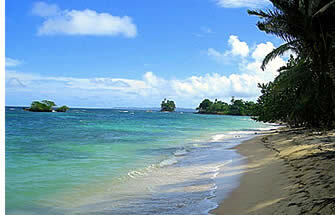 Isla Paridita is an All-Inclusive Private Island in the Chiriqui Gulf National Marine Park of Panama. Being one of the few accommodations offered in the National Park, the island remains as unspoiled today as when it was first discovered by early European explorers 500 years ago. This magical island is part of the Paridas archipelago, an emerald scatter of over 50 uninhabited tropical islands in Panama's Pacific coast, about 35 miles south of the border with Costa Rica. Many native Panamanians are not even aware of the islands' existence and this is how the chain came to be known as the "Lost Islands of Barú". While Isla Paridita is remote and private, it is easily accessed by a 30 minute boat trip from the fishing village of Boca Chica, which itself is about a 40 minute drive from David or a 1.5 hour drive from Boquete, Panama's Eco-Adventure Capital. Guests are usually picked up either at the Enrique Malek International Airport in David, Chiriqui or at their hotel in Boquete. 50 minute flights are available to David from both Panama City and from San José, Costa Rica (or a longer bus journey). We can take care of everything: you just have to sit back, relax and start imagining the amazing adventure that you're about to live! With a perfect blend of sea and greenery, Isla Paridita offers 65 acres of startling beauty, boasting four miles of coastline and abundant wildlife. Sapphire blue, aquamarine and jade waters; white, black and gold sand in its five private beaches; coastal tide pools, two fresh water lagoons (with crocodiles!) and 30 meter cliffs rising from the ocean make this a fascinating and visually arresting private environment. 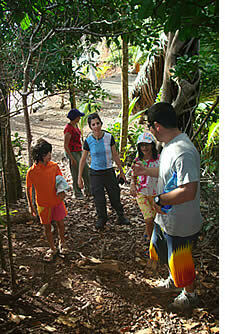 The island is alive with a myriad of tropical plant life, dense, sky-reaching hardwood, palm trees and exotic birds. And in its surrounding waters: all sorts of fish with vibrant colors, humpback whales, dolphins and sea turtles ply the channels between the islands. Isla Paridita has a savannah-type tropical climate with temperatures ranging from 25°C - 30°C (80°F - 90°F) during the day and 22°C (70°F) during the evenings and average annual rainfall between 2,000mm and 2,500mm. 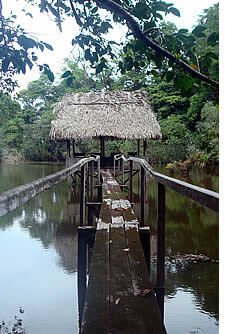 Panama has two seasons - the "dry" season and the "green" season. The dry season is from December until April and green season from May until November. "Dry" means it rarely rains and the green season means typically a refreshing tropical shower each afternoon. It rarely rains all day, which means that rain is no obstacle for tourism activities. The gentle ocean breezes that filter down the extinct Volcán Barú, Panama's highest peak, keep the relative humidity level to about 30%, considerably lower than the rest of Panama's beaches and islands in the Caribbean. The Lost Island Archipelago was discovered by the Spanish in the early 1500's. The islands fresh spring water, indigenous fruits and the calm waters off Isla Paridita's Varadero Bay were used to harbor the Spanish Galleons while repairs were made using local woods and the craftsmanship of the native inhabitants. Isla Paridita offered an elevated position where light cannons could be positioned to thwart off enemy attacks during their vulnerable state. Stone walls and ancient artifacts including stone tools and pottery chards are still found today. At and around Isla Paridita and the Chiriqui Gulf there are plenty of things to do for several days or even a couple of weeks! Not one but five private beaches, each of them with soft sand that is a mixture of white, black and gold, provide visitors with plenty of opportunities to enjoy the island's warm waters. 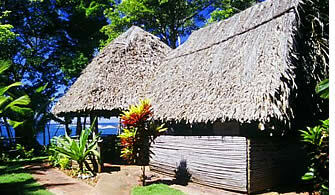 At the beach that is just in front of the cabins you can find some really nice coral reefs and sea grass beds. Spectacular species of fish like the emperor angel and tropical fish of every color adorn the sea bed - the bicolor parrot fish is the most colorful of the lot. Limpets, snail and conch are abundant as well. Spiny lobster, small octopus and marine turtles (leatherback and hawksbill) are a common sighting - the turtles laying their eggs in the soft sand of neighboring islands at certain times of the year. If you're fit enough and feel more adventurous you can sea kayak all around the island, but make sure to take your snorkeling gear along so that you can explore the underwater world as well. 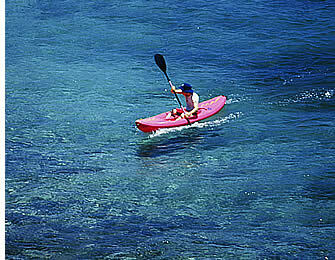 You can even sea kayak to other islands such as Paridas, Gámez or Bolaños. And if you'd like to, take some lunch for a delicious picnic, and when you fancy a rest and happen to discover another of the island's private beaches, aim for the shore and enjoy a well deserved banquet unders the shade of the palm trees. And after all that strenuous activity, come back to the small inhabited area of the island for a refreshing drink and lie down on the beach under a palm tree, just taking it all in and indulging your senses with all of the surrounding beauty. Many just go back to their cabin and have an afternoon nap on their hammock. 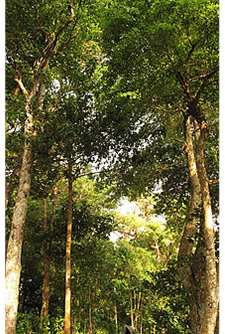 Isla Paridita offers visitors numerous hiking trails through pristine tropical humid rain forests in which you'll encounter magnificent trees such as maría, rivet, hawthorn cedar, bitter cedar, espavé, corotú and others. 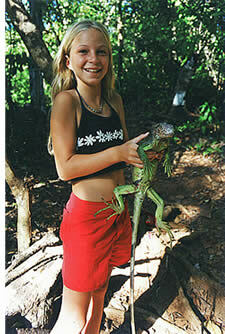 You may also bump into one or two green iguanas. 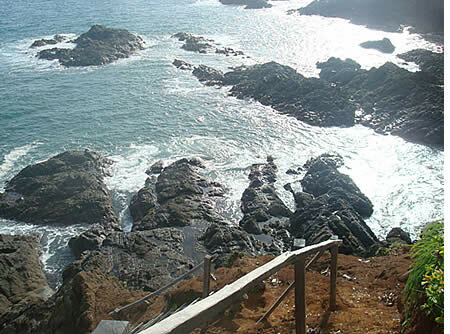 These hiking trails will also take you to the island's bordering cliffs and hidden tide-pools, where you'll be able to relax in the company of many tiny fascinating creatures. For bird lovers, in the mangroves it's easy to observe the presence of the tiger egret and of the mangrove warbler. It is common to see little doves, redfronted parrots, dirtyfaced parrots and orange-bellied parrots flying from island to island. Various colorful hummingbirds can also be spotted especially in the mornings. And if Paridita Island wasn't exotic enough, its two fresh water lagoons decorated by beautiful orchids and bromeliads are home to a dozen or more crocodiles. Much has been said about the scuba diving in the Chiriqui Gulf, at least by those fortunate enough to have experienced it: with unbelievable dive sites around the Secas archipelagos, Ladrones and Coiba Island, the possibilities are infinite. Around Ladrones and Secas, visibility can be up to 30 meters, and in Coiba Marine National Park (declared a World Heritage Site by UNESCO) you'll encounter Central America's most extensive coralline reefs, rich in sea creatures of all type. 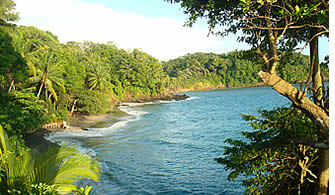 According to a 2005 UNESCO report, the Chiriqui Gulf holds more species of fish than the Galapagos and Cocos Islands. The abundance and diversity of sea life can be only described as spectacular. The following extract comes from an account by Dr. Todd Capson, of the Smithsonian Institute of Tropical Reseach in Panama.
" The majority of the diving takes place around off shore pinnacles or seamounts. These jagged volcanic pinnacles rise from deep water, some break the surface while some rise only to within 120ft from the surface. These rocks hold an abundance and diversity of life, which at times can be only described as spectacular. Huge schools of Barracuda, Jack, Rainbow Chub and Pacific Spade fish are common. 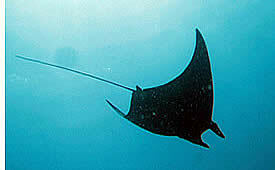 Giant Manta and Spotted Eagle rays frequent the area. Schools of Devil and Mobola rays too. White Tip reef shark along with Tiger, Bull, Hammerhead, Black Tip and Galapagos shark are common. Along with Jew Fish, Amber Jack and Giant Snapper and three species of Turtle. There are only a few species of hard and soft corals. However these are abundant on many sites. In amongst the rocks the diversity of life continues. Sea Horse, Pipe Fish, Frog Fish, Stargazers, Nudibranch, Harlequin Shrimp and many types and color of eel, from Starry Moray's to Giant Green Morays. Big animal encounters are frequent. Humpback, Sperm and Pilot whales migrate through the park. Orcas and Whale shark can be seen at certain times of year too. Dolphins are a common sight, even while scuba diving. At certain times of day these sites bristle with life waiting too be cleaned by Silver Grunts, King Angel, Sergeant Majors, Butterfly Fish and Wrasse. Giant Nurse shark are also a frequent visitor to these shallow areas, seeking sheltered places to sleep." 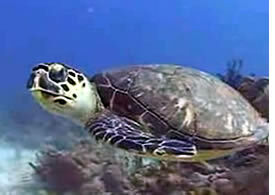 Scuba Diving trips from Isla Paridita can be arranged at an additional cost. Diving season is year round, and the best months are from December to April. For more information checkout our special packages. Sport fishing in the Chiriqui Gulf beyond the Marine National Park is legendary around Ladrones, Secas and Contreras Islands. Big Game Fishing and Angling is quite amazing in Cébaco Bay and Deep Sea Fishing is superb around Montousa Island. 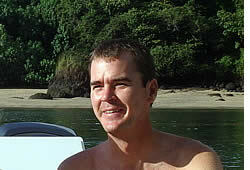 Fishing Panama's Coiba Island and nearby Hannibal bank is a fisherman's nirvana. We fish by trolling for Wahoo, Mahi-mahi, and Ahi tuna early in the day. Later, live bait for Amberjack and Cubera snapper or spin casting against rocks for exciting surface strikes works well. On longer trips we can try our luck for Marlin, Sailfish and big Tuna. 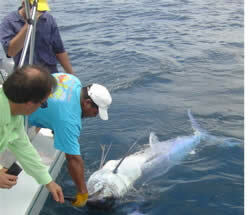 We release all billfish (Marlin, Sailfish, etc) and any fish after we've caught our fill. We fillet the fish we will keep as soon as we can and bring back only clean filets in iced storage bags. If the fishing is good we make fresh sushi or ceviche on board. Our boat is the Geisha, a new 30' aluminum Sounder designed and built for Alaskan fishing grounds and is an extremely sea worthy boat. It has a spacious comfortable cab indoors and a shaded back deck for fishing and seating. The cab has a dinette with two padded bench seats, a captain's station with modern electronics, a padded vee berth for laying down, a marine head, and a freshwater sink. The large opening windows, hatches and fans keep the cab cool on the warmest of days and can be closed tight if the weather gets rough. The back deck has comfortable chairs, ample fish boxes and both salt and fresh water hoses for rinsing off. There is a built-in transom ladder for getting in and out of the water easily. The two quiet and efficient four-stroke outboards will cruise fully loaded at 24 knots. And our captain is Merrill (Mario) Bennett, a licensed captain who speaks English, Spanish and French fluently, is a certified scuba diver and has fished and snorkeled in these waters for over 15 years. Private fishing charters are arranged from Isla Paridita upon request. For pricing please go to our special extra packages. On your way to the Isla Paridita and on our day trips to neighboring islands such as Gámez and Bolaños we frequently encounter schools of dolphins. In Spanish, "delfines", they are called "bufeos" by the local fishermen. If we aren't lucky enough to bump into them, we can take the boat out for a while and try to find them! Whale watching season in Panama's Chiriqui Gulf is between July and November, being August, September and November the most active months, when humpback whales migrate thousands of miles from the icy waters of their winter feeding grounds in the south (near Chile and the Antarctic). The warm shallow waters of the Chiriqui Gulf are the perfect place for mother whales to give birth (mother/calf pairs are known to seek shallower waters). 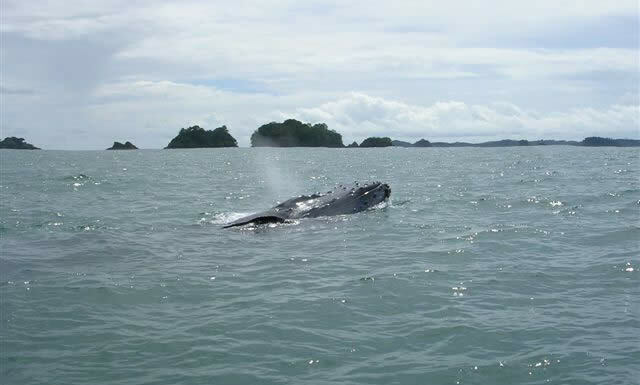 Sightings with calves generally occur near island groups, rocky outcrops, or near the mainland and whales can be seen around Isla Paridita and many other islands of the Chiriqui Gulf during these months. Sometimes whales can even be seen from guest's cabins and during our boat excursions to the neighboring islands which are included in the basic package to Isla Paridita. Due to the high number of sightings, south western Panama appears to be, according to Kristin Rasmussen, at Cascadia Research Collective in Olympia, Washington, an important nursery area for humpback whales migrating from the Southern Hemisphere. During these very important months calves will drink thousands of gallons of milk from their mothers, gain body fat for their trip back home and learn to dive and survive in the ocean. A very strong bond will unite mother and calf. For those really interested in whale watching, during certain special occasions one can go out with Panama's top whale researcher, Kristin Rasmussen on an eight hour whale-watching/research expedition. The private charter includes a whale presentation and lecture in which you can learn all about whales: the type of whales in Panama, the amount of calves a whale usually has, and you can even listen to the whales singing using a hydro-phone (which is also quite handy to locate them!). For rates on whale watching tours with research scientist Kristin Rasmussen please go to special packages & rates. Although there are plenty of things to do in Isla Paridita you can always choose to just sit back and relax: a cabin by the beach, good food, nice drinks, a good book and a hammock under the shade can definitely make your day. The living structures on Paridita Island blend naturally with the tropical environment and were designed with self sustaining and environmentally friendly principles in mind. Four rustic yet comfortable open air bungalows have been constructed as native palapas and create a traditional village enclave. Two are located right on the beach and the other two are high up in the cliffs offering awing views of the magnificent surroundings. Imagine waking up feeling the fresh breeze of the sea and contemplating its vastness right in front of you. The decks have colorful hammocks to enjoy the superb view and take a siesta after a long day of swimming, snorkeling, kayaking, hiking, reading or whatever you like! Decorated with tasteful, local-style furnishings, and secluded open air stone showers with hot water and bathroom facilities, the palapas are made of island materials including native hardwoods, "caña brava" and palm thatching utilizing the fine handiwork of local canoe makers. 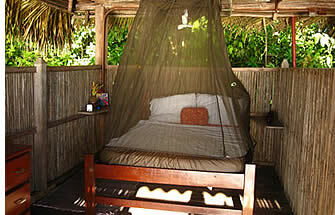 At night, there are low power LED lights, a mosquito net and fans over each teak double bed. The palapas and the main "bohio" (a large round dining, living and kitchen structure) have been strategically positioned to provide 360-degree views of the ocean and coastline, and take advantage of the cooling breezes that come off the ocean during the evenings, while providing the utmost in privacy between them. The kitchen and common bohio is equipped with refrigeration, hot and cold running water, a gas stove and your iPod can interconnect with the stereo. Electricity for domestic needs and water systems is supplied by custom, silent, state of the art solar voltaic system. Drinking water of superb quality is supplied by five parapet walls. Meals are served in our open-air "bohio" (a large round dining and kitchen area), and also in the garden area right next to it that boasts panoramic views of the ocean and neighboring islands. Our meals are prepared fresh and flavorful. We work with local fishermen and use fresh fruits and vegetables grown on and around the island. We offer an ever changing menu of steak, fresh fish and seafood dishes, tasty sandwiches and salads along with an assortment of snacks and drinks. All meals, snacks and drinks (including rum) are prepared by your host so you can just sit back and relax. We can also accommodate vegetarians and those with other special diets: just let us know and we'll take care of you! Many local fisherman are also out there looking for their day's catch so we may as well make the most out of it and get some fresh lobster, crab, shrimp or one of the many fish that they might have already caught. Nothing like fresh sea food for a nice dinner to end the perfect day. Rates for lodging are per night and assume double occupancy in each cabin, as well as a 2 night minimum stay and the use of 2 cabins. If only one cabin is used, a 3 night minimum stay is required. 2 night stays in 1 cabin can be arranged by covering the $200 water transportation fee in addition to the quoted price. Single occupancy in a cabin is possible as long as there is availability. 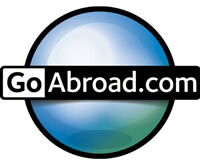 Children staying with their parents have access to special rates. All rates below. Packages INCLUDE: 30 minute water transportation from Boca Chica to and from Isla Paridita, accommodations at Isla Paridita, all meals (you can let us know your food preferences), snacks and drinks all day long including rum (guests are free to bring additional beverages). A boat tour of the neighboring islands such as Gámez or Bolaños (spending part of the day at them), a guided island jungle tour, unlimited access to our private beaches, nature trails, free use of our sea kayaks and snorkeling gear, National Marine Park Entrance Fees, 10% Hotel Tax and a memory that will last a lifetime! Rates DO NOT INCLUDE hotel pickup in Boquete or airport pickup in David and transportation to and from our private pier in Boca Chica (1.5 hours from Boquete, 1 hour from David), but can be arranged for $100 per trip, or $175 roundtrip (1 or 2 persons, for each additional person add $25). Special extras available: scuba diving charters, private fishing charters and all day whale watching/research expedition tours. To make a reservation at Isla Paridita please contact us. When availability is confirmed, hotel policies and instructions to provide credit card details over a secure web form to cover a 50% deposit are then sent to guests by email. Our private island can be entirely rented out for groups of up to eight persons for $1350 USD per night all inclusive (maximum of 8 guests). * Prices are in US Dollars. Rates for lodging are per night and assume double occupancy in each cabin, as well as a 2 night minimum stay and the use of 2 cabins. If only one cabin is used, a 3 night minimum stay is required. 2 night stays in 1 cabin can be arranged by covering the $200 water transportation fee in addition to the quoted price. 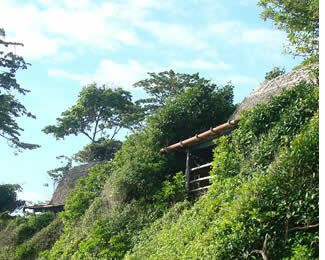 Single Occupancy is $325 USD per person per night (if cabins are available). Children 14 and under staying with their parents in the same cabin pay $95 USD per night or two children in their own cabin pay $325 USD per night. Guests arrive to pier in Boca Chica at 10:00 a.m. and transfer back to mainland is at 10:00 a.m. Due to the islands fragile eco-system and our commitment to preserving the national park, trips are on a limited basis. We keep our groups to a maximum of 8 people. This ensures a more private, personal and tranquil island experience with a minimal impact on the environment. Scuba diving trips to Secas and Ladrones cost $165 USD per person and require a minimum of 4 guests. Scuba Diving Trips to Coiba require at least one overnight stay (they'll not be charged at Isla Paridita) and cost $165 for the first day and $275 each additional day. Scuba prices includes two-tank dive with tank, weights and dive-master. Scuba charter to Coiba also includes live-aboard accommodations and 3 meals per day. Half day private fishing charters in and around Islas Paridas and Isla Bolaños, 10 miles away from Boca Chica, with lunch included, for up to 8 passengers costs $550. Full day fishing expeditions to Isla Secas or Isla Ladrones, 20 - 30 miles away from Boca Chica, with breakfast and lunch included, for up to 6 passengers cost $775. Full day deep sea fishing charters to Coiba Island, Montuosa and Hannibal Bank, 50 to 60 miles away from Boca Chica, with breakfast and lunch included for a maximum of 4 passengers costs $995. English/Spanish/French spoken certified captain, optional assistant; ice cold juices, sodas, beer & water; excellent meals and snacks; all fishing rods, tackle, lures and baits; full sets of snorkeling gear and lessons. The whale watching tour comprises an eight hour whale-watching/research expedition with whale researcher Kristin Rasmussen, presentation and lecture. All trips include licensed boat captain, lunch and refreshments. 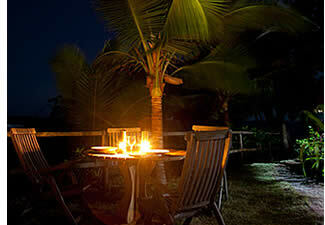 Breakfast and dinner for all expeditions are back at Paridita Island. Extra beds and/or cribs are unfortunately not available. For families with small children the kids can sleep with them or they can rent an additional cabin and one of the parents can sleep with their children. If a child is less than 5 years of age and stays with his or her parents, no additional charge is made. The island can be a dangerous place for small children if they are not properly supervised. There are numerous cliff drop offs and areas that are not fenced where serious injury could result. All children must be supervised by their parents 100% of the time. "It is possible that the Gulf of Chiriqui constitutes a particularly significant nursery area for mothers with calves"
Impressions from Habla Ya's co-founder, Julio Santamaría: "Just got back from Isla Paridita and I can't get over it. I couldn't stop saying to myself: wow... amazing... wow... OMG! It's just stunning... It has to be in my Panama Top 5..."
The following video gives you a glimpse of the outstanding beauty of this area. We invite you to sit back, relax and see for yourself why the Lonely Planet's most recent edition for Panama refers to this Park as Chiriqui's lowlands most precious gem... lots of the footage from this video is from our private island: ISLA PARIDITA! 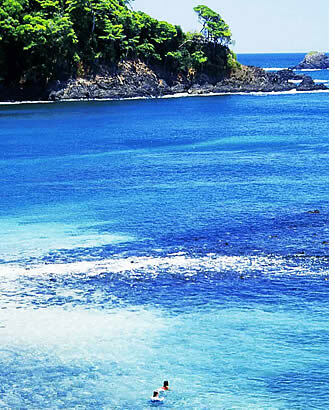 The Chiriqui Gulf National Marine Park was founded in 1994 to protect 14,730 hectares (36,400 acres) of extensive coral reef (19 in total), mangrove swamps, 25 islands and marine meadows. The islands are small hills of sedimentary rock that can reach 100 meters above sea level. The islands have a savannah-type tropical climate with an average temperature around 27°C and average annual rainfall between 2,000mm and 2,500mm. The rainfall allows humid tropical forest with trees like Maria (Calophyllum longifolium), oak, spiny cedar, Spanish cedar, and espave (Anacardium excelsum). Locally this park is also known as the Paridas archipelago, being Parida and Paridita Island the only inhabited isles. Other islands include: Santa Catalina, Pulgoso, Gámez, Tintorera, Obispo, Obispone, Los Pargos, Ahogado, Icacos, Corral de Piedra, Bolaños, Berraco, Bolañitos, San José, Linarte, Saíno, Sainitos, Iglesia Mayor, Carey Macho and Carey Hembra. The orography of these islands is characterized by small sedimentary rock hills that rise to more than 100 meters above sea level and the presence of abundant coastal plains. A tropical savannah climate, with annual temperatures average above 27°C and an annual average rainfall between 2.000 mm and 2.500 mm, allows the development of the tropical humid forests in the different islands in which dominant trees like the maría (Calophyllum longifolium), the rivet (Tabebuia rosea), the hawthorn cedar (Bombacopsis quinatum), the bitter cedar (Cedrela odorata), the espavé (Anarcadium excelsum) and the corotú (Enterolobium cyclocarpum). On the numerous and extensive island beaches, where threatened marine turtles come to nest, especially the leatherback (Dermochelys coriacea) and the hawksbill (Eretmochelys imbricata), both coconut palms (Coconuts nucifera) and manzanillo (Hippomane mancinella) grow abundantly. 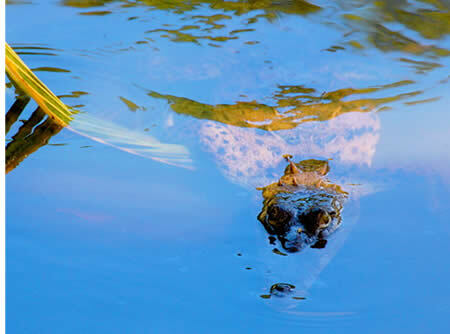 The most abundant reptile is the green iguana (Iguana iguana), in particular in the Bolaños island, and the most common amphibian is the green and black little frog (Dendrobates auratus). In the mangroves of the islands Parida and Paridita it is easy to spot the tiger egret (Tigrisoma mexicanum) and the abundant Mangrove Warbler (Dendroica petechia erithacorides). Flying from island to island it is common to see pale-vented pigeons (Columba cayennensis), red-fronted parrots (Amazon autumnalis), brown-throated parakeets (Aratinga pertinax) and orange-chinned parakeets (Brotogeris jugularis). In the larger islands, groups of howling monkeys (Alouatta palliata), painted raccoons (Procyon lotor) and pacas (Agouti paca) have been registered as well. The wealth of the sea that surrounds the archipelago with its coral reefs and seagrass beds is the most significant of the marine park. In the reefs there are some formations of Porites lobata chorale and Hidrozoo, commonly known as fire coral (Millepora intricata). There, live spectacular species of fish like the emperor angel (Holocanthus passer), the bicolor parrotfish (Scarus subroviolaceus) and the white tip shark (Trienodon obesus). Another way to access the Golfo de Chiriqui National Park is through the little port of Pedregal, just 10 kilometers from David. From there it is nearly a one and a half hour drive by boat to Isla Paridita (much more expensive than from Boca Chica). In search of a unique tropical vacation? Exotic Isla Paridita is waiting for you! Contact us! There is a wide diversity of flora and fauna set in very beautiful, virtually untouched scenery. 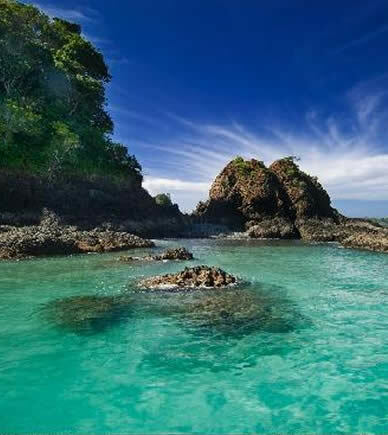 The pristine state of this archipelago is due primarily to the fact that Coiba Island was a penal colony from 1919 to 2004. 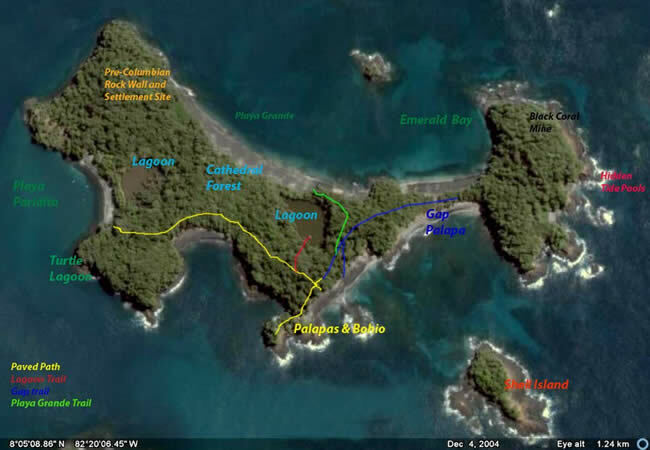 80% of Coiba Island is covered with original vegetation, the other 20% of forest was affected by the penal colony camps and some limited deforestation. Coiba Island has coastal plains under 100 meters high in the north and southeast of the island, with low hills up to 200 meters high covering the rest of the island. In the centre of the island, Cerro de La Torre at 416 meters and Cerro San Juan at 406 meters are the highest points on the island. At least 3 different species of marine turtles come here to nest. In addition the islands have some of the best coral reefs of Panama Pacific. The average annual temperature is about 26° C and average annual rainfall is 3,500mm. 1,450 species of vascular plants have been recorded here, and in particular lots of cotton trees, panama wood, and spiny cedar. The Spanish Co-operation Agency AECI have had a biological station in the park since 1993. And they've noted 36 species of mammals, 147 birds and 39 species of amphibious and reptiles. Coiba is the only place in Panama where it is still possible to see a whole flocks of the threatened scarlet macaws. The Coiba spinetail is worthy of note. The coral reef in Damas Bay covers 135 hectares and is the largest in Central America. 69 species of sea fish, 12 echinoderm, 45 mollusks and 13 crustaceans have been identified in the protected area. Among these are the whale shark, tiger shark, manta, dolphin fish, and yellow-fin tuna. The humpback whale, the killer whale (orca), pantropical spotted dolphin and the bottlenose dolphin can also be found in these waters.